I thought it would be fun to photograph a ‘week in my life’ of food things. I am always intrigued by what other people eat on a regular basis, checking out shopping trolleys in the supermarket and phoning girlfriends for inspiration. It is the daily mouse wheel for me – the panic as the children announce that they are hungry and I open the fridge seeking some kind of miracle to materialise before me. I have read about the wonders of a weekly meal plan yet I never seem to manage to prepare / stick to it on a regular basis. So here are some ideas that perhaps you might like too. Followed by a delicious locally made yoghurt pot that I have added almond butter and raspberries to. Accompanied by my version of a Virgin Mojito. Let’s face it, we all melt at the thought of cheese on toast (pun totally intended!) – hot or cold weather, it’s just good anytime, anywhere. Here I’ve topped it with some locally made Guava Jam which is just the right sweetness to cut through the sharp cheddar cheese. I made a non-alcoholic Mojito by adding lots of muddled mint leaves and fresh lime to a tall glass of iced, fiery ginger beer. It is So Good. The mint and lime add such a freshness to the spiciness of the ginger. In fact, it goes really well with the cheese on toast combo. My new favourite snack is berries with almond butter. I go one step further here, with fruit coulis yoghurt, berries and a good dollop of almond butter through the middle. This veggie sauce is really tasty. I added a pile of steamed vegetables, some cheese shavings and a Green Juice packed with good things. Plain yummy, and it feels pretty healthy too. You could add sour cream and guacamole too, of course. I couldn’t. It is not avocado season here right now, so I will have to wait until June apparently! Green Juice – juice 1/2 cucumber, 4 sticks of celery, 2 apples, 1 pear, handful of spinach, handful of kale, 1 lemon. Toast the following spices for 1 minute in a deep frying pan – 1.5 tsp ground coriander, 1.5 tsp ground cumin, 2 tsp smoked paprika. Put aside. Then place the following ingredients in a food processor – 1/2 onion, 3 crushed garlic cloves, 125g chopped celery, 70g chopped fennel, 1 large chopped and peeled carrot, 375g button mushrooms, 1 red chili, 12g peeled and grated fresh ginger and 1 diced red pepper. Cook this vegetable base gently in a large saucepan with the toasted spices and a large pinch of salt for 10 mins. Meanwhile, cook 100g of flageolet beans in 550mls of boiling water for 10 mins. To finish the chili, add 100g tomato purée, 200g piquillo peppers and a 400g tin chopped tomatoes to the vegetable base and simmer for 10 mins. Add the cooked flageolet beans, a 240g tin red kidney beans, 100g brown sauce and 2tbsp Worcestershire sauce. Cook for 5 more minutes. Stir in 40g grated 100% cocoa chocolate. Mix through 10g fresh coriander and serve. Day 3: Teriyaki Beef with Chilled Soba Noodles and Braised Pumpkin. To drink – fresh lemon and mint-ade, or fresh lemonade with mint. My daughter said this is the best tasting meat ever! I loved the pumpkin too. The noodles are refreshing and delicate. Fresh lemonade …. well that is a longstanding favourite. Not to blow my own trumpet or anything, but my husband told me that this is freaking delicious. Oh, and there is red, red wine. I like that! This is a ‘leftovers’ dinner – roast lamb that is garlicky and salty sautéed with onions, pumpkin, celeriac, almonds, pine nuts and XL couscous. I served it with feta cheese, plain yoghurt and olives. Combining some of my favourite ingredients that together make a taste sensation: rocket leaves, sun-dried tomatoes, goats cheese, honey, olive oil and balsamic vinegar. For a boost of iron I made some beetroot and apple juice. Not strictly ‘dinner’ I know. However, I had to share these because they are just so good. I love an English tea in the afternoon and there happened to be some fresh blackberries in the fridge to marry sharply with the dark and sweet berry preserve on the accompanying scones. To be altogether decadent, I dolloped mascarpone cream on top. One just isn’t enough of these. I love fish. I could easily forget meat live happily ever after on vegetables and seafood. My Caribbean twist today is simply to make a coconut sauce to go with the fish by sautéeing 1 onion, 4 cloves garlic, 1 peeled de-seeded tomato, 1 diced celery stalk and simmering with a can of coconut milk. I love little roast potato cubes on the side with lots of steamed veggies. A glass of rosé seems appropriate at sunset, don’t you think? 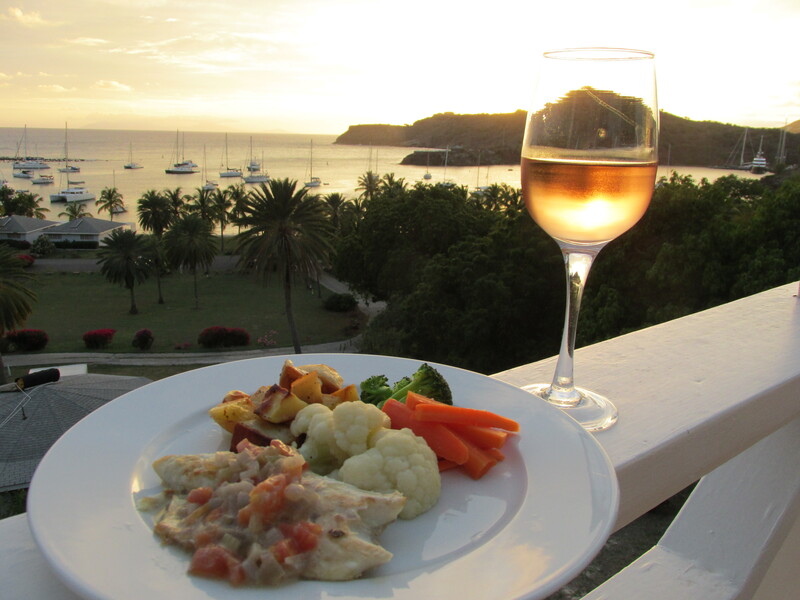 If you like some of these ideas, have a look too at my chicken broth and Antiguan rum punch. Do you have a great way of planning menus, I’d love to hear! All advice welcome. In other news, I have guest blogged on the boating website Yothop and you can check out my guide to a better resumé here. See you next week for more chatter from the ceaselessly warm and wonderful Antigua. What a beautiful place, and some really great looking good too! I’d love to give guava jam a try some time. Hey Rory, guava jam is definitely worth hunting down – would be nice on toast too with a cup of english breakfast tea 😉 Enjoyed your blog too, thanks for the link! I’ll have to track some down then! Ah good, I’m glad you liked it. I’m enjoying yours too, getting seriously envious looking at your pictures though! 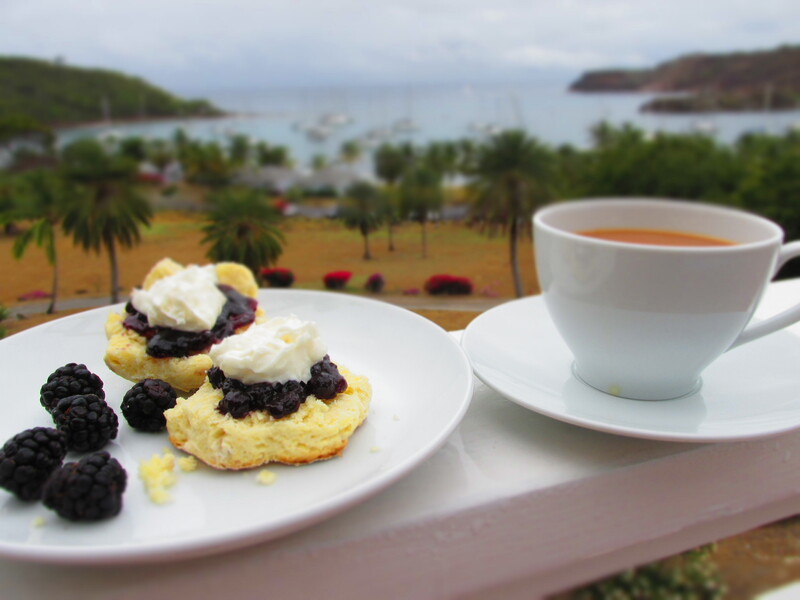 Hi Liesl, Delighted to have you join the chat – Antigua is a lovely place. Stay in touch when you get here!